With the Edward Snowden affair, and fact that the U.S. just may have, um, spied on its French ally, I started to think about those little things that are quiet tells about your nationality. Would you hold up as a CIA spy in Paris? For example, how do you eat French fries and hamburgers? With your hands? You're American. The French do it with a fork and knife. Yes -- even the fries, which are, as I've discussed, not necessarily French. Also, as a French person, you would never ask for ketchup. So, if passing as a French person is your espionage duty to protect national security, part of your sacrifice is going to be eating dry fries. In fact, eating almost anything with your hands is not terribly French. One of our French friends goes to extremes -- even by French standards -- and crushes potato chips up on his plate, with a fork, in order to be able to eat them with his fork and knife. It's a classic cross-cultural moment, and I take a dozen photos. I am laughing too hard at the time to notice whether or not our friend is offended, but we are still friends, so that's a good sign. Butter your bread? American. Eat it plain? French. And do you put the bread on your plate? American. On the table itself? French. Honestly. The other evening, Anthony and I were at a party and a bowl went around with a big bunch of grapes in it. It passed by the one other American couple, then Anthony, then me, and each of the four of us picked off a grape, then another few grapes. By the time the bowl got to the last of us, a few of the French people were staring at us: "Is that how Americans eat grapes?!" Well yes and, frankly, we couldn't even imagine another way to eat them. It turns out, all the French people ripped a small twig of grapes off the bigger branch, then picked off the individual grapes on their own plate. 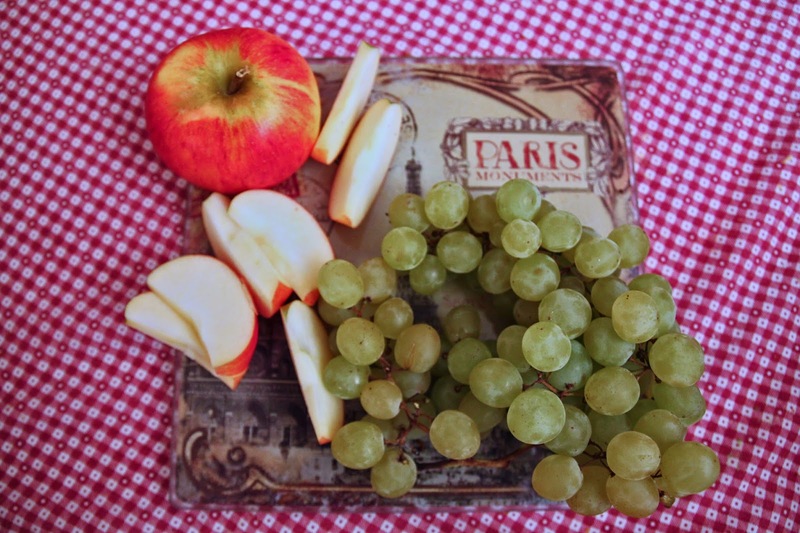 The next time I served grapes to a bunch of French people, I made it easy on them and cut it into smaller twigs. How thoughtful of me. It's how and what we eat, how we dress, and, even for the bilingual children, how we speak. Gigi speaks perfect French, with a perfect Parisian accent, even according to the French themselves. But more than once I've seen her speaking fluently and then, when she needs to think of something, she says, "Ummmm." Dead give-away. A French person would say "Euhhhh." The volume of the conversation also gives it away. Much to Anthony's chagrin and embarrassment, we realize that we are the loudest family in virtually every restaurant. The same holds true with trains, planes, museums, and just about any other public space. Maybe we are a particularly loud family, but I don't think so. Our girls are generally very well behaved and respectful; we simply talk, laugh, and interact with each other a lot, and at a volume that is decidedly un-French. Have a question about any of this? Raise your hand. Quick now, tell me: Did you raise your hand with all your fingers extended? Congratulations, you're a real American. 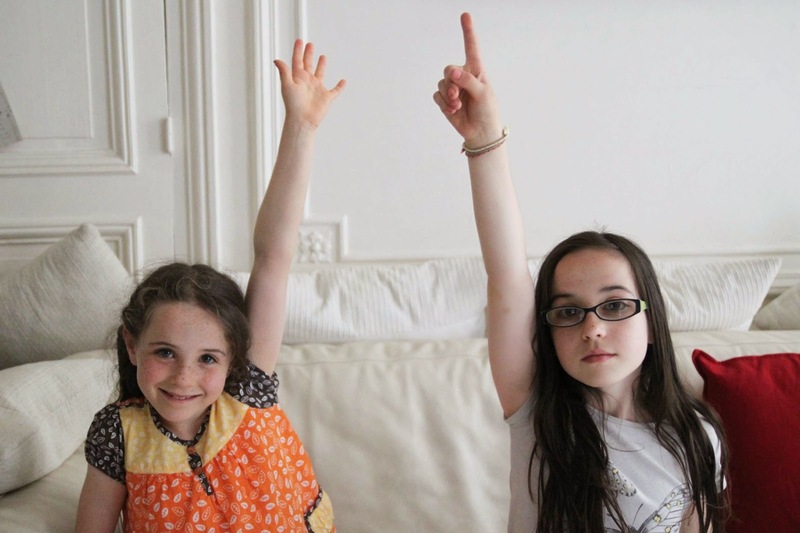 Or did you raise your hand with your index finger extended, pointing to the sky? Felicitations, vous êtes un vrai français (in other words, you're French). And, as I've mentioned before, even if you were living in a Tom Clancy Cold War era novel where you were trained for years to be a mole in France, you would get tripped up when somebody asked you to recite a Jean de la Fontaine poem. Only those raised on "Le Corbeau et Le Renard" can do it full sing-song justice. So much to learn before you start your life of espionage. 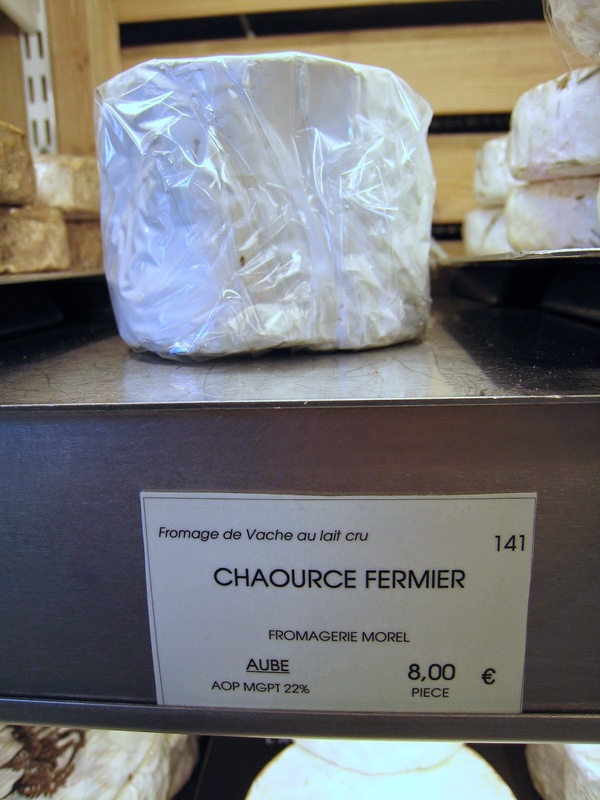 Chaource, pronounced "Sha-OORS", is a cows' milk cheese named after the village of the same name in the departement of l'Aube in the region of Champagne-Ardenne, not too far east of Paris. It's thought to be an ancient cheese made originally by monks in the area, at the Abbey of Pontivy. It was definitely known as early as the 12th century, when it was mentioned in texts, and by the 14th century, it was mentioned in conjunction with royalty including King Charles IV and Louis X's queen. Each wheel of cheese itself is not that ancient, however. The cheese is only aged between 2 weeks and 2 months. The end result is an ultra buttery, creamy cheese with a white bloom crust on it in the style of a Camembert or Brie. No wonder: It's made with ultra high fat milk and tastes like it. It's velvety on the tongue and when it's melted pretty much tastes like a dream sauce to pour over pasta, vegetables, bread, or shoe leather, for that matter. It seems like anything would taste delicious with melted Chaource on it. In a good Chaource, made from raw milk (and in the case of the one I buy, farmhouse-made), the cheese has hints of soil, farm, and grasses. When it's this melty, so that it's literally dripping out of its own skin, even a French person might be tempted to just take the oozing part and spread it on a hunk of bread, leaving the skin on the plate. However, leaving the white moldy crust on such a beautiful cheese -- a farmhouse, high-end version of a Chaource -- is just about criminal. It's certainly very un-French. If you neatly cut off all your moldy crusts, even the soft, creamy ones like this, then anybody looking at your plate will know, immediately, that you are not French. Future spies, you are warned.